Canada and Alaska offer so much that you may wish to enjoy them at a more languid pace. Why rush something magical? If so, you’ll be delighted to discover that we’ve handcrafted this itinerary with you in mind. Seeing and experiencing Alaska’s rugged wilderness doesn’t mean you can’t spend a little time in some more comfortable corners. 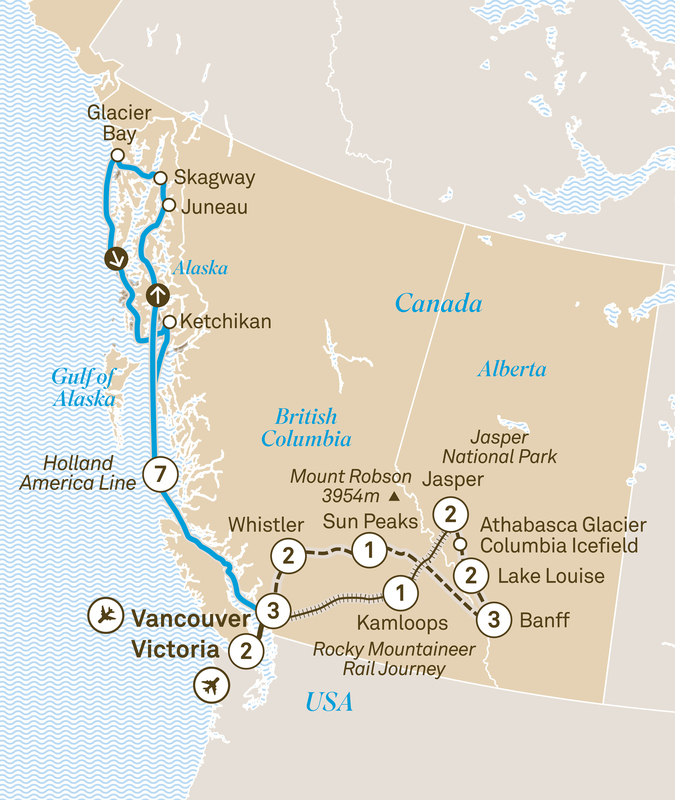 With this itinerary, you’ll enjoy three nights in Vancouver, three nights in Banff, a Breakfast with the Bears adventure, and a little more free time to appreciate the wonders of your surrounds. You’ll get to enjoy all the wild and wonderful landmarks that make this region so special, and in a slightly more leisurely frame of mind. Welcome to Victoria for an exclusive two night Special Stay at the Fairmont Empress. Celebrate with a welcome dinner and toast to the wonderful adventure awaiting you and your fellow travellers. Take in the sights and scents of beautiful Butchart Gardens. This morning, be the first to see Capilano Suspension Bridge Park, which opens early exclusively for Scenic. Take a simulated flight over Canada’s greatest landmarks, or treat yourself to Vancouver’s best dim sum or some signature Italian meatballs. Alternatively, take a creative photography tour. A special treat awaits as you share breakfast with Grouse Mountain’s resident bears, Grinder and Coola. Enjoy GoldLeaf Service as beautiful Canada passes by your window on the legendary Rocky Mountaineer. Stay overnight at a Kamloops hotel. Keep a look out for wildlife such as elk as you arrive at Fairmont Jasper Park Lodge for your two night stay. Enjoy local specialities in your choice of dining venues tonight. Take the ‘Ice Explorer’ onto the Athabasca Glacier. The opulent Fairmont Chateau Lake Louise is your Special Stay for the next two nights, where you’ll retreat to a stunning lakeview room. Fine dining, or something more casual – it’s entirely up to you. Meet a Canadian Mountie, wearer of the red serge. Settle into your mountain or valley view room for your three night Special Stay at the Fairmont Banff Springs. Tonight, select from a diverse range of restaurants. Ride the Banff Gondola and take in the magnificent views or take a helicopter flight. Alternatively, enjoy a Bow River float trip, play nine holes of golf or take a relaxing soak in the mineral pools. You can also take a guided nature walk or head into the mountains by wagon for a Cowboy Cookout lunch. In July, you can also opt for a day trip to the famous Calgary Stampede. Enjoy an exclusive ‘Rocky Mountain Round Up’ of fabulous entertainment. Explore the township of Banff, cocooned by Banff National Park. Canada’s history is brought to life by your voyageur presenter. Sun Peaks Grand Hotel welcomes you this evening. Expert researcher Michael Allen will present exclusive insights about black bears. Take a zipline adventure or the Peak 2 Peak Gondola. Alternatively, go on a mountain adventure tour or a jet boat ride. Enjoy a farewell Canada dinner as you look forward to your Alaskan cruise. Join your Cruise Director for a seven night Alaskan cruise on board Holland America Line’s ms Nieuw Amsterdam in a verandah stateroom. For the duration of your cruise, the ‘Signature Beverage Package’ has been included. Savour a festive on board lunch. Visit Alaska’s state capital, only accessible by air or sea. You’ll love Skagway, where historic shop facades echo the days of the gold rush. Marvel at the icy drama of Glacier Bay. Visit the ‘salmon capital of the world’. Continue southwards on your elegant cruise.